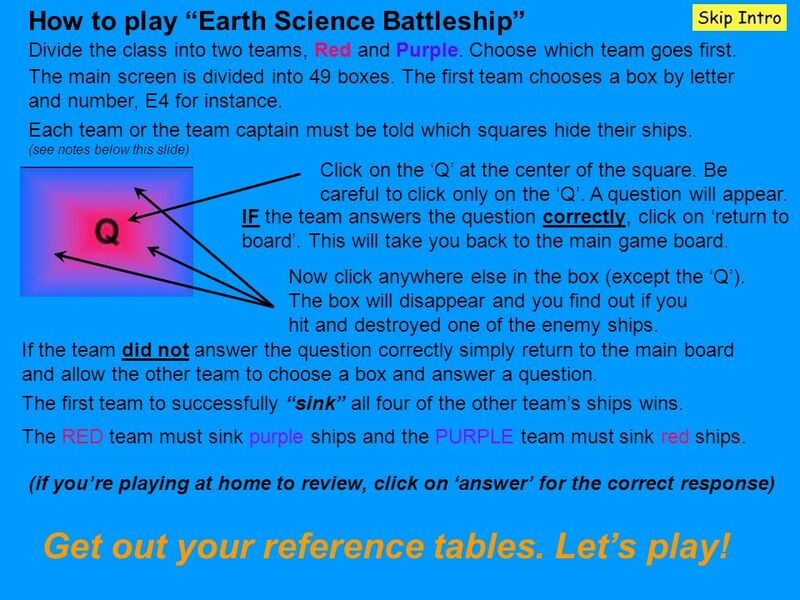 3 How to play Earth Science Battleship Divide the class into two teams, Red and Purple. Choose which team goes first. The main screen is divided into 49 boxes. The first team chooses a box by letter and number, E4 for instance. 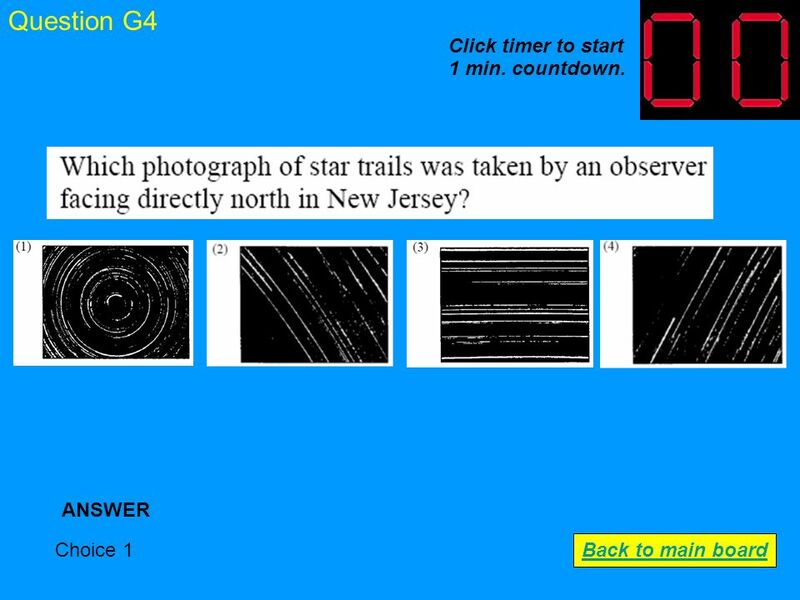 Click on the Q at the center of the square. Be careful to click only on the Q. A question will appear. IF the team answers the question correctly, click on return to board. This will take you back to the main game board. Now click anywhere else in the box (except the Q). The box will disappear and you find out if you hit and destroyed one of the enemy ships. 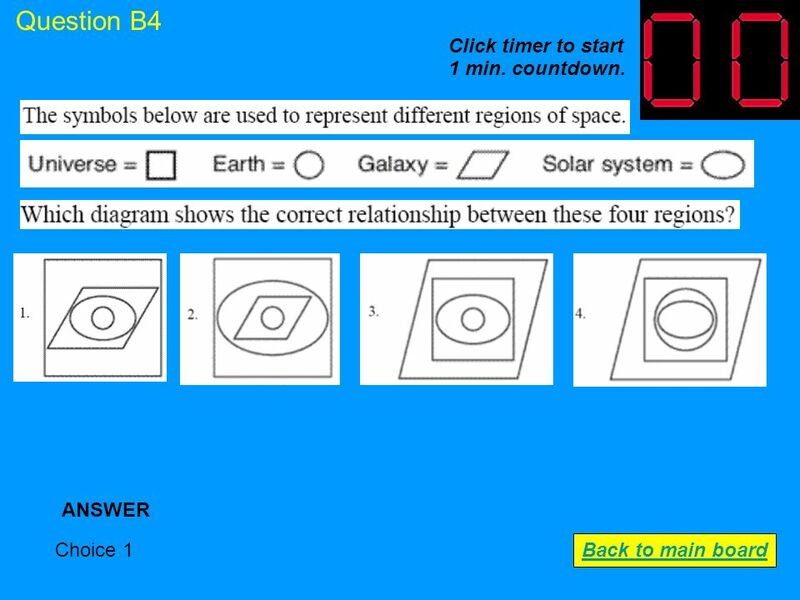 If the team did not answer the question correctly simply return to the main board and allow the other team to choose a box and answer a question. The first team to successfully sink all four of the other teams ships wins. The RED team must sink purple ships and the PURPLE team must sink red ships. (if youre playing at home to review, click on answer for the correct response) Each team or the team captain must be told which squares hide their ships. (see notes below this slide) Get out your reference tables. Lets play! 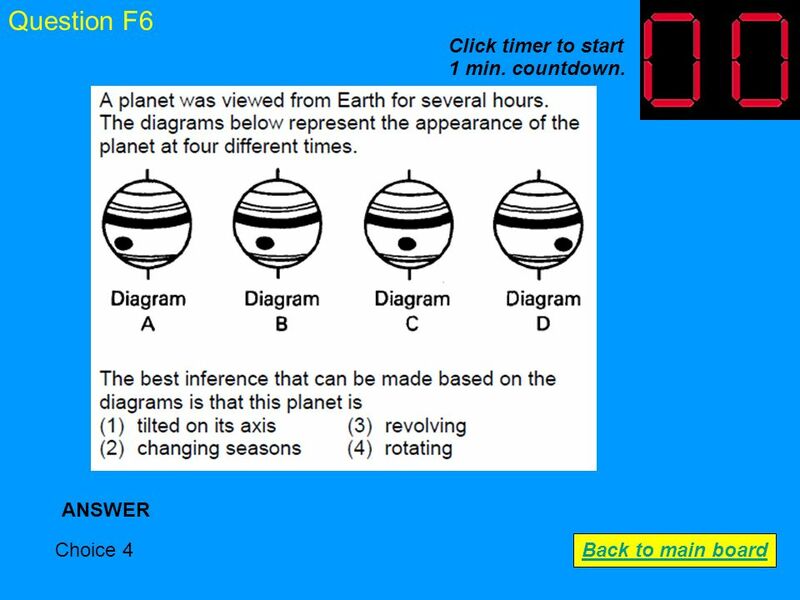 5 Question A1 Saturn ANSWER Back to main board Click timer to start 1 min. countdown. 6 Question A2 Nebula ANSWER Back to main board Click timer to start 1 min. countdown. 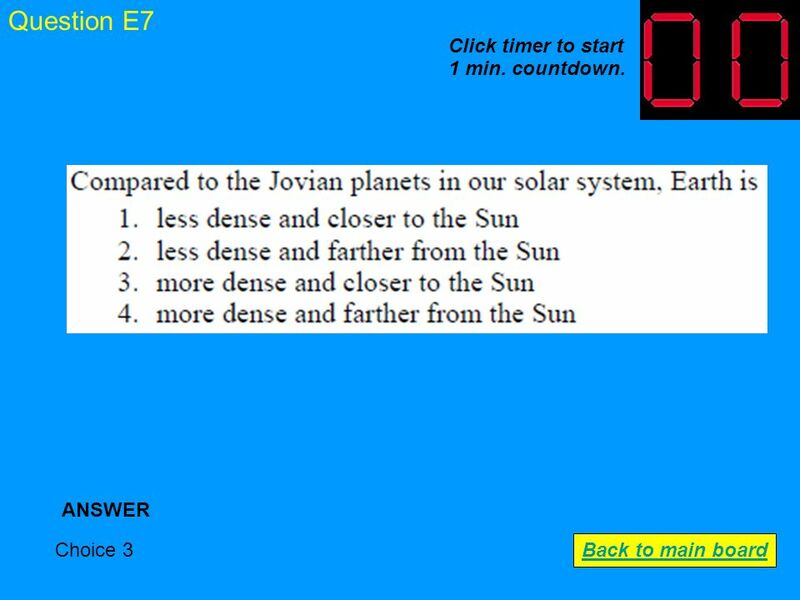 7 Question A3 Venus ANSWER Back to main board Click timer to start 1 min. countdown. 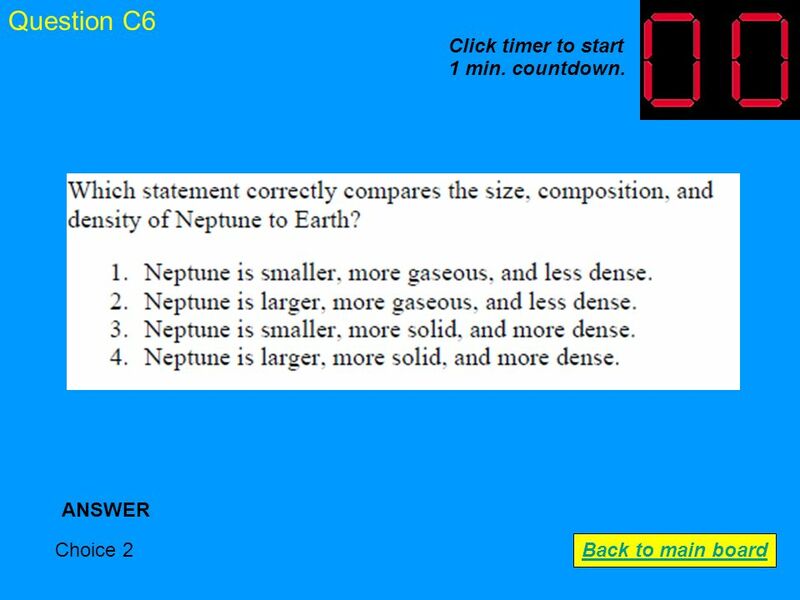 8 Question A4 Choice 3 ANSWER Back to main board Click timer to start 1 min. countdown. 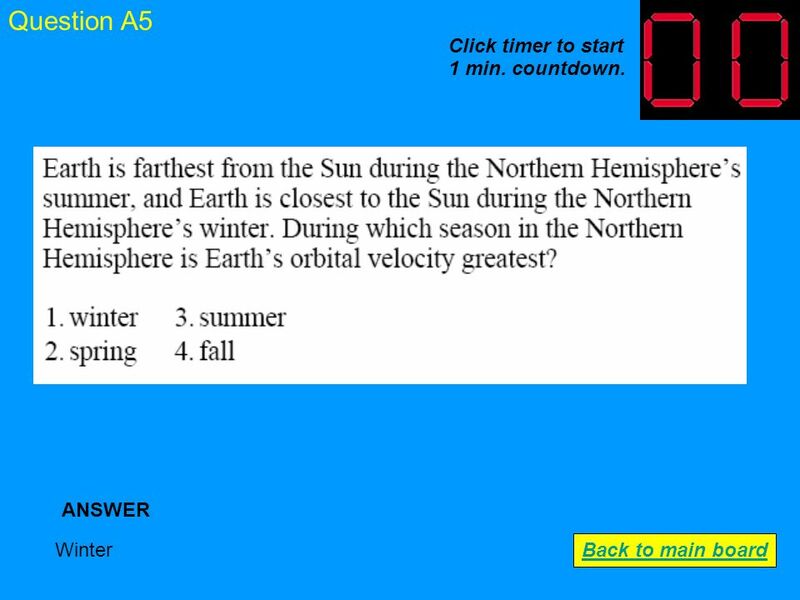 9 Question A5 Winter ANSWER Back to main board Click timer to start 1 min. countdown. 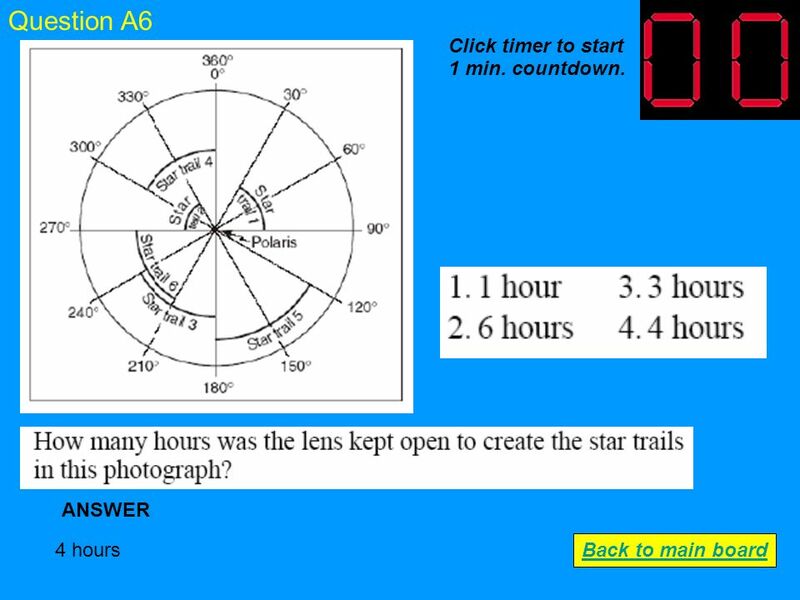 10 Question A6 4 hours ANSWER Back to main board Click timer to start 1 min. countdown. 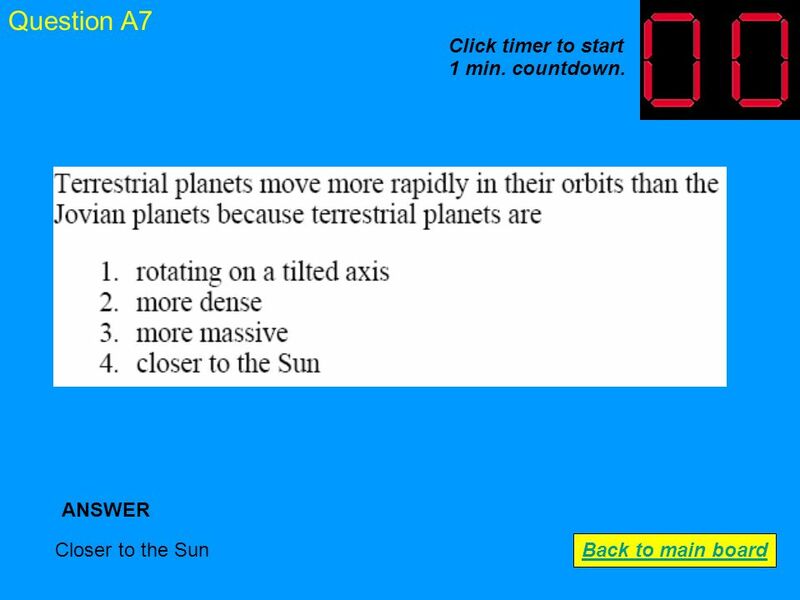 11 Question A7 Closer to the Sun ANSWER Back to main board Click timer to start 1 min. countdown. 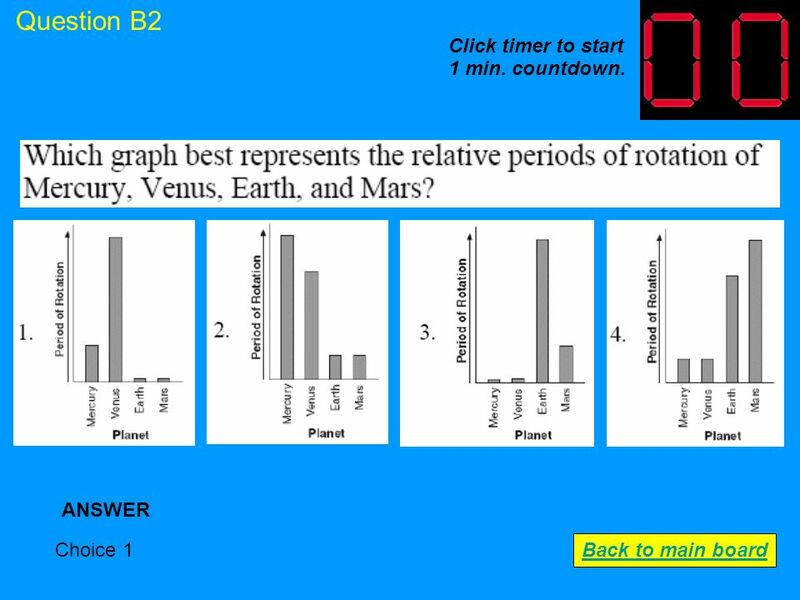 12 Question B1 Choice 1 ANSWER Back to main board Click timer to start 1 min. countdown. 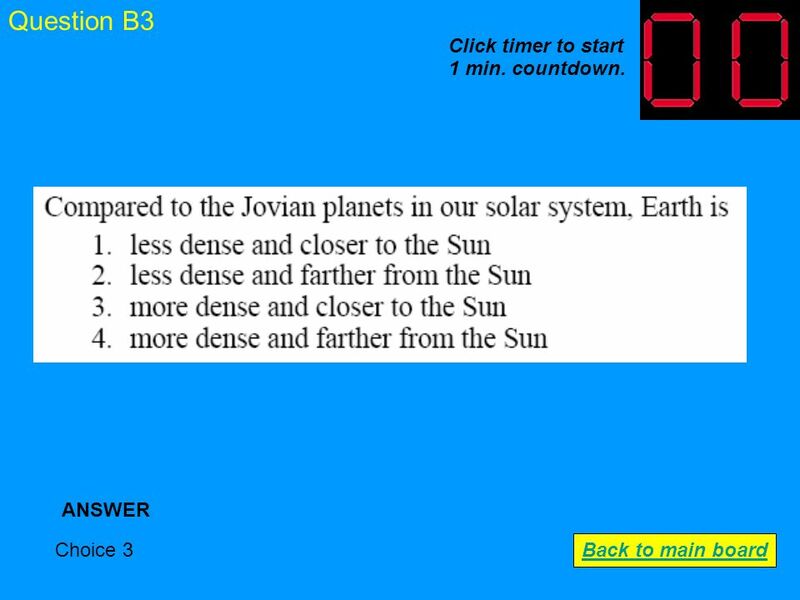 13 Question B2 Choice 1 ANSWER Back to main board Click timer to start 1 min. countdown. 14 Question B3 Choice 3 ANSWER Back to main board Click timer to start 1 min. countdown. 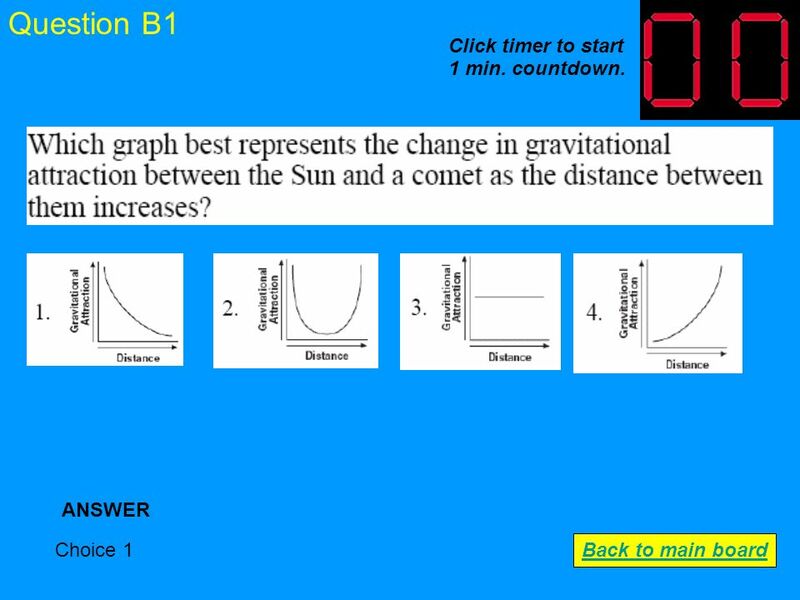 15 Question B4 Choice 1 ANSWER Back to main board Click timer to start 1 min. countdown. 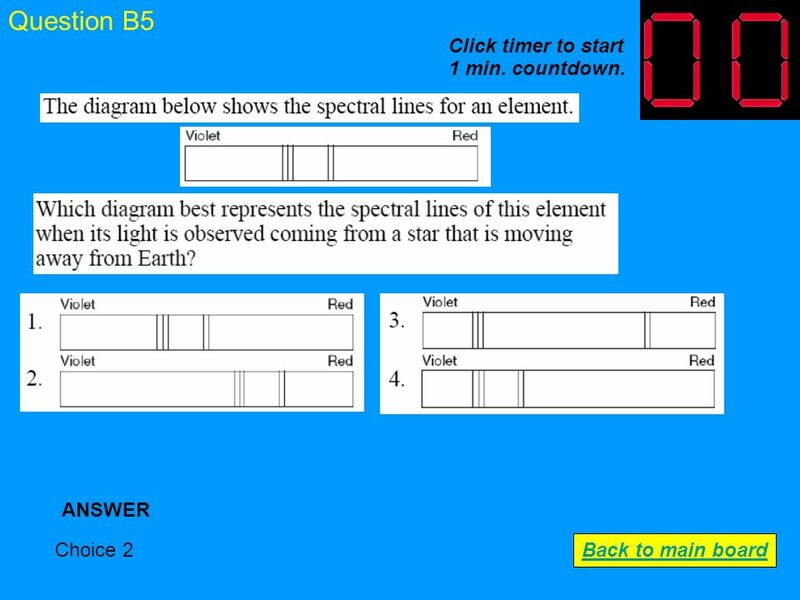 16 Question B5 Choice 2 ANSWER Back to main board Click timer to start 1 min. countdown. 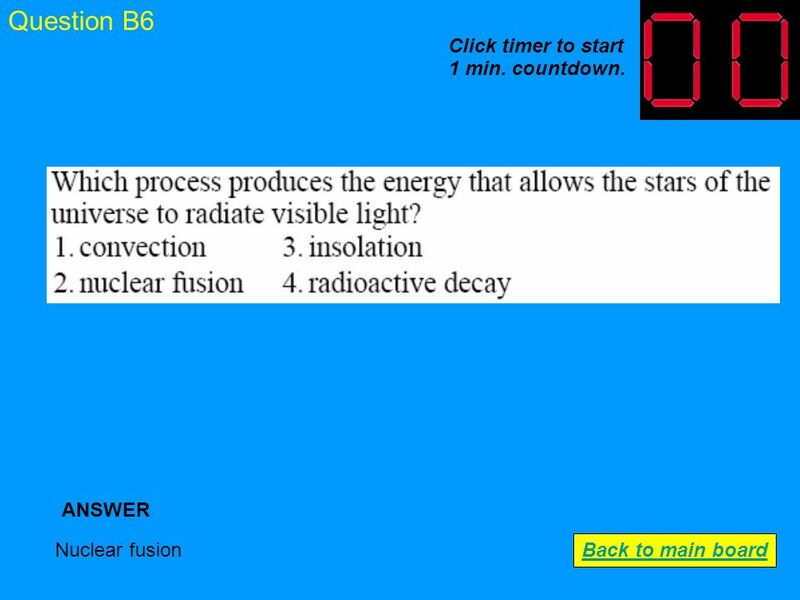 17 Question B6 Nuclear fusion ANSWER Back to main board Click timer to start 1 min. countdown. 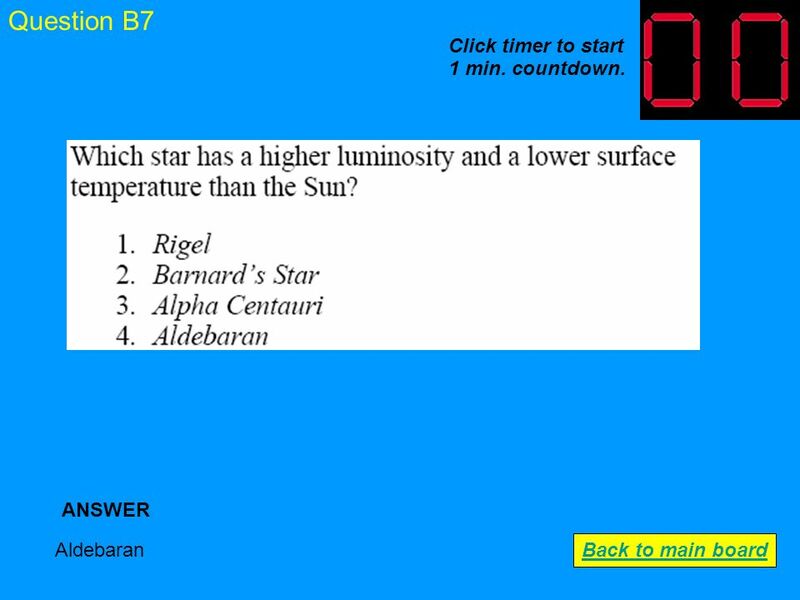 18 Question B7 Aldebaran ANSWER Back to main board Click timer to start 1 min. countdown. 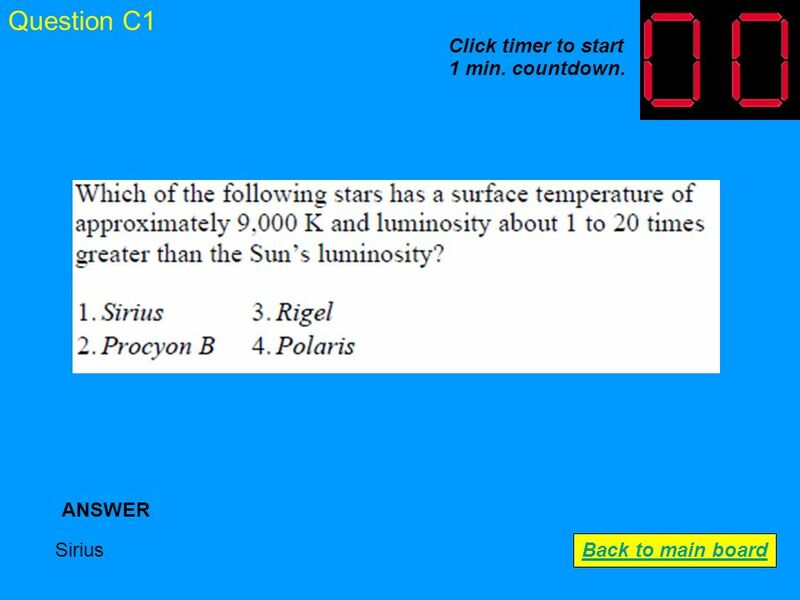 19 Question C1 Sirius ANSWER Back to main board Click timer to start 1 min. countdown. 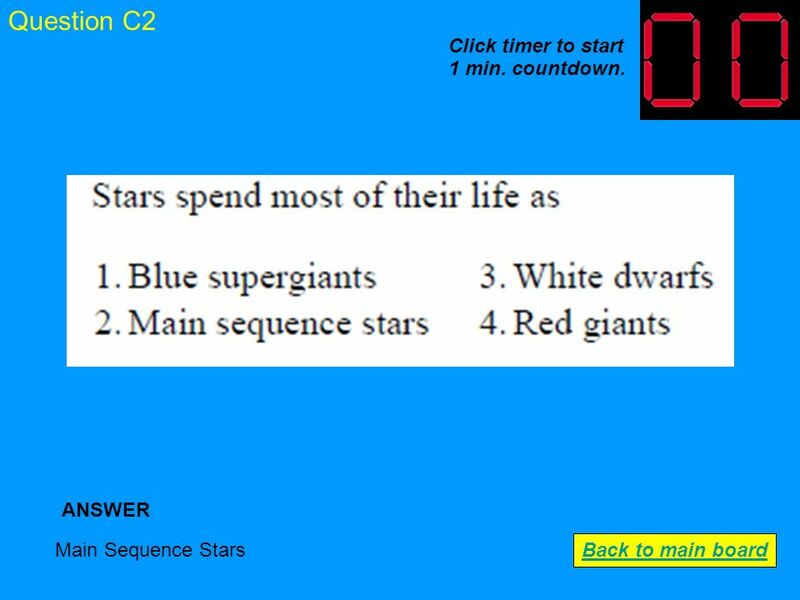 20 Question C2 Main Sequence Stars ANSWER Back to main board Click timer to start 1 min. countdown. 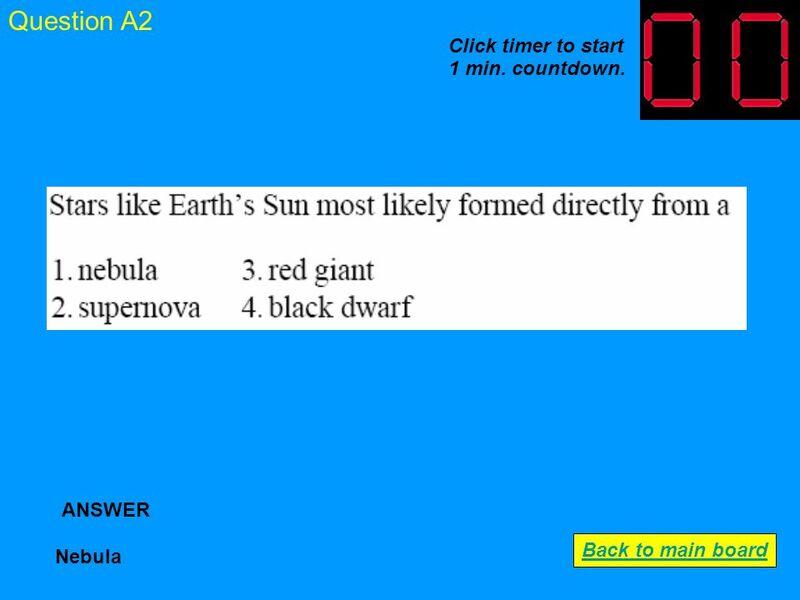 22 Question C4 Main sequence ANSWER Back to main board Click timer to start 1 min. countdown. 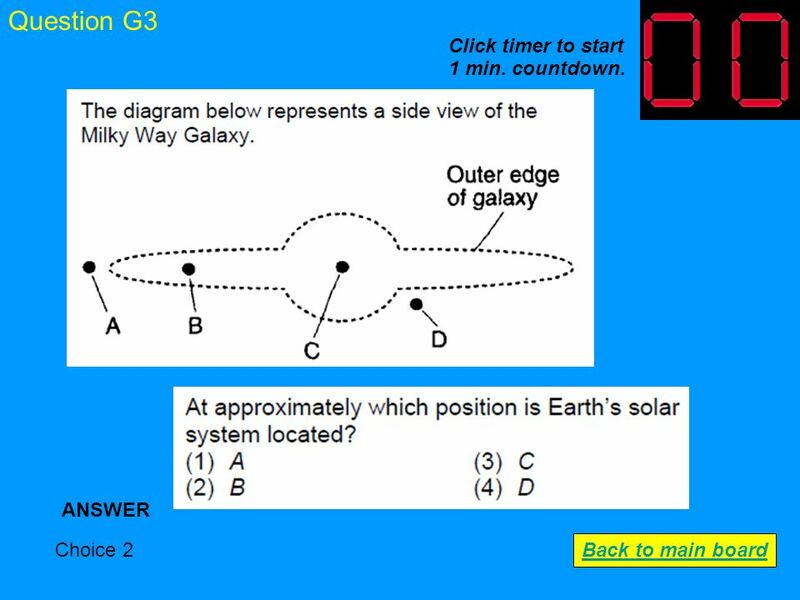 23 Question C5 A (closest) ANSWER Back to main board Click timer to start 1 min. countdown. 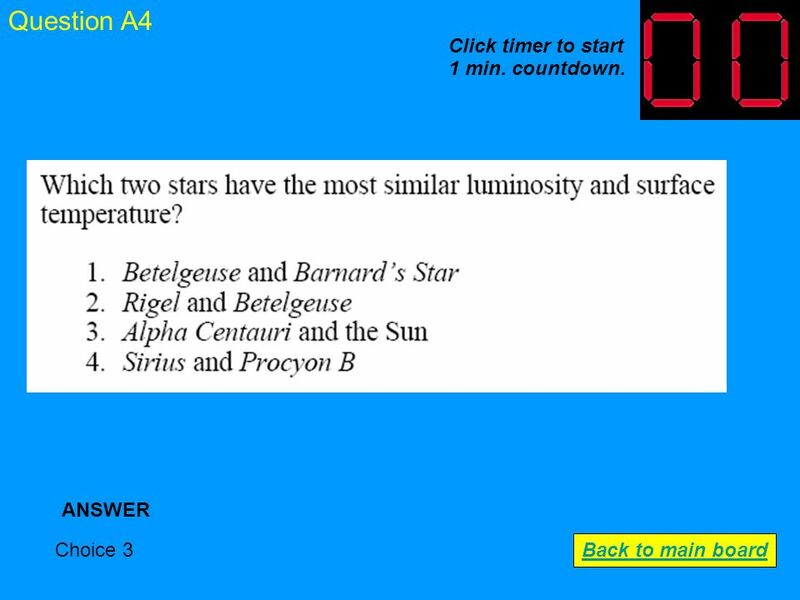 24 Question C6 Choice 2 ANSWER Back to main board Click timer to start 1 min. countdown. 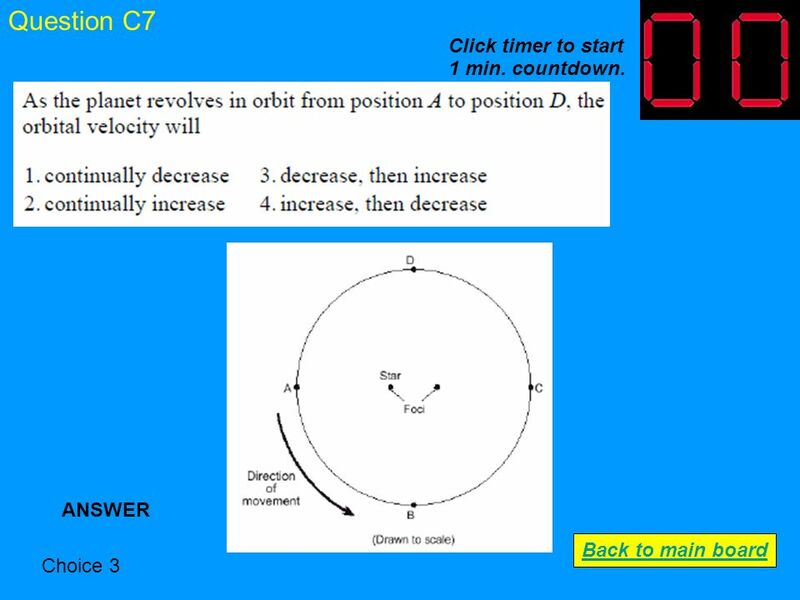 25 Question C7 Choice 3 ANSWER Back to main board Click timer to start 1 min. countdown. 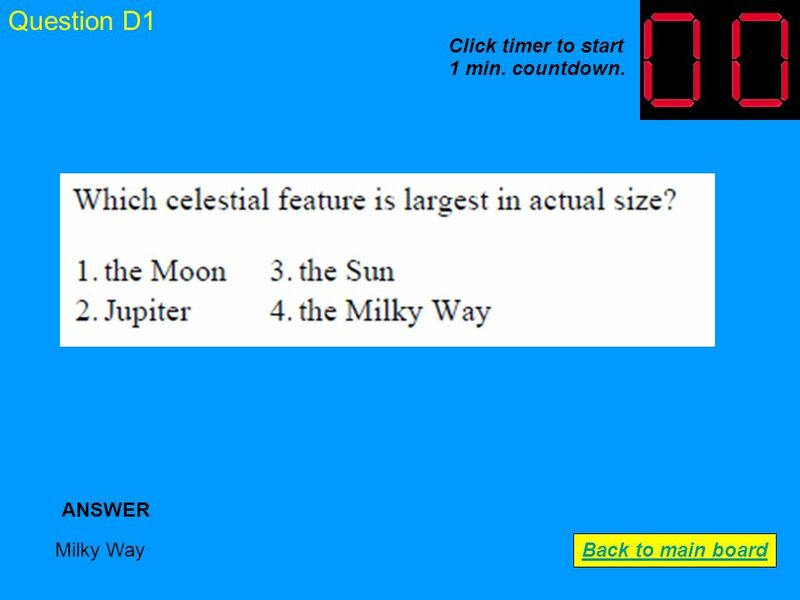 26 Question D1 Milky Way ANSWER Back to main board Click timer to start 1 min. countdown. 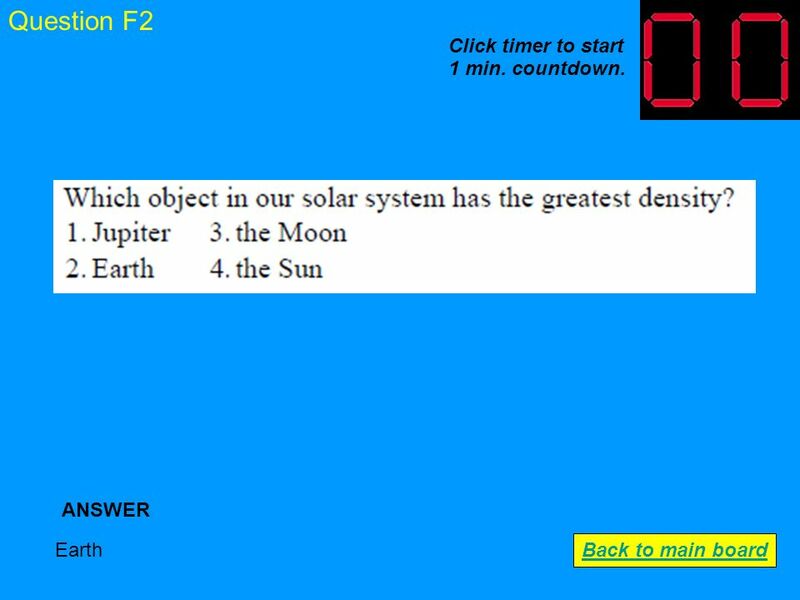 27 Question D2 Less ANSWER Back to main board Click timer to start 1 min. countdown. 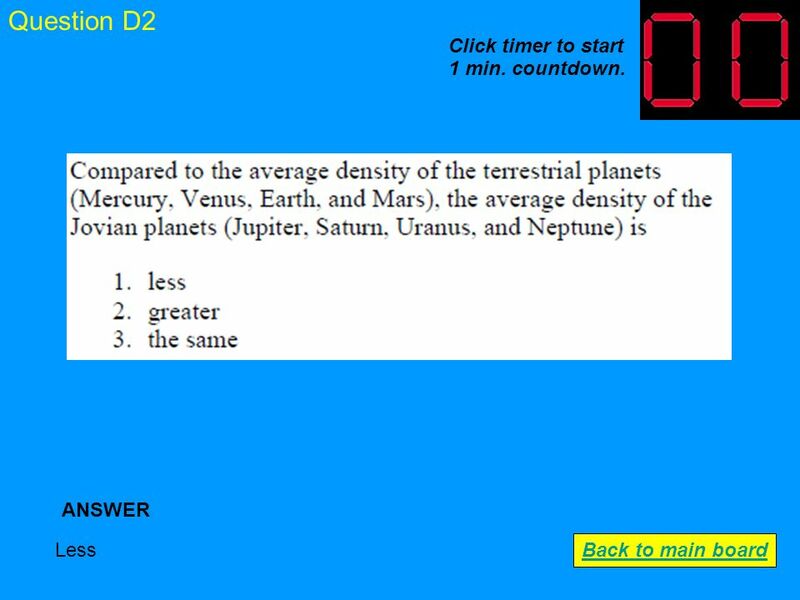 28 Question D3 Choice 4 ANSWER Back to main board Click timer to start 1 min. countdown. 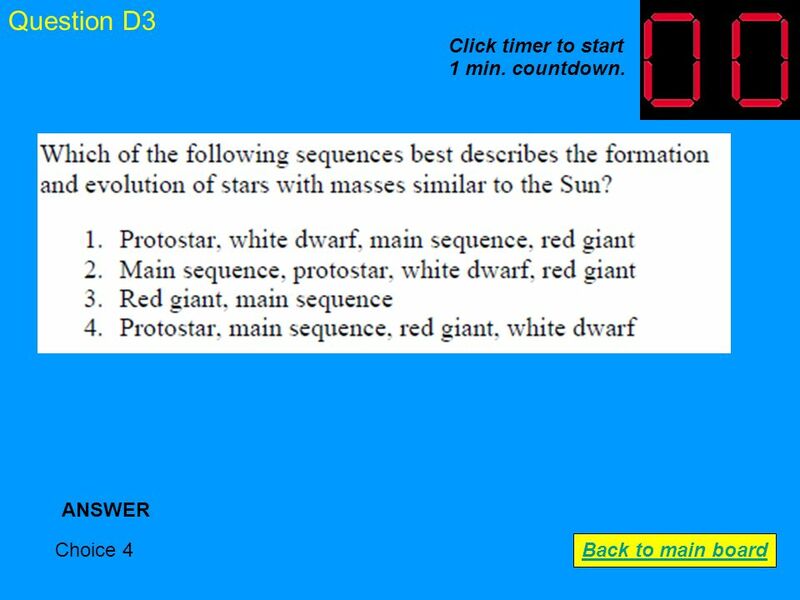 29 Question D4 Choice 4 ANSWER Back to main board Click timer to start 1 min. countdown. 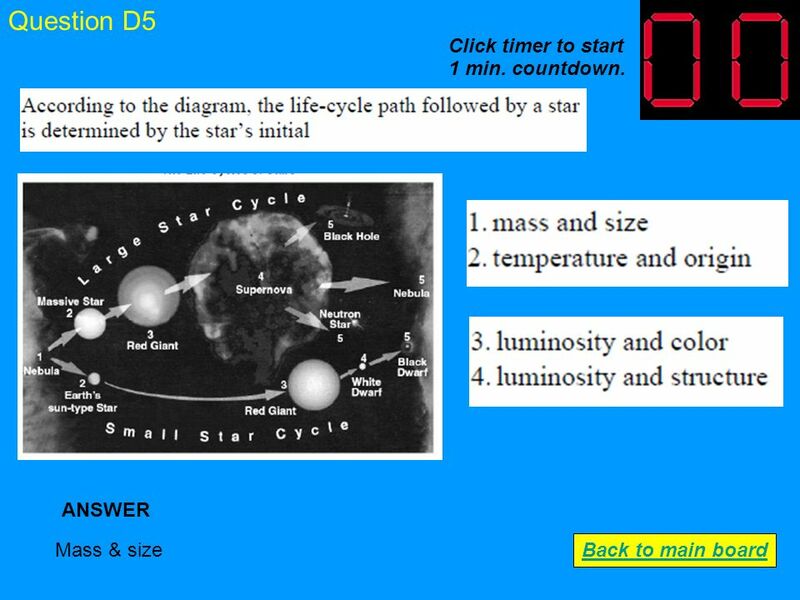 30 Question D5 Mass & size ANSWER Back to main board Click timer to start 1 min. countdown. 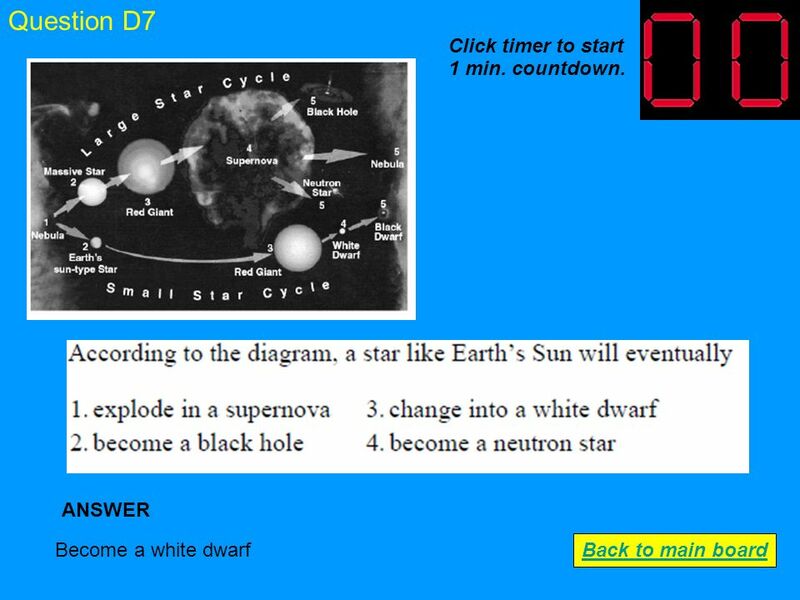 32 Question D7 Become a white dwarf ANSWER Back to main board Click timer to start 1 min. countdown. 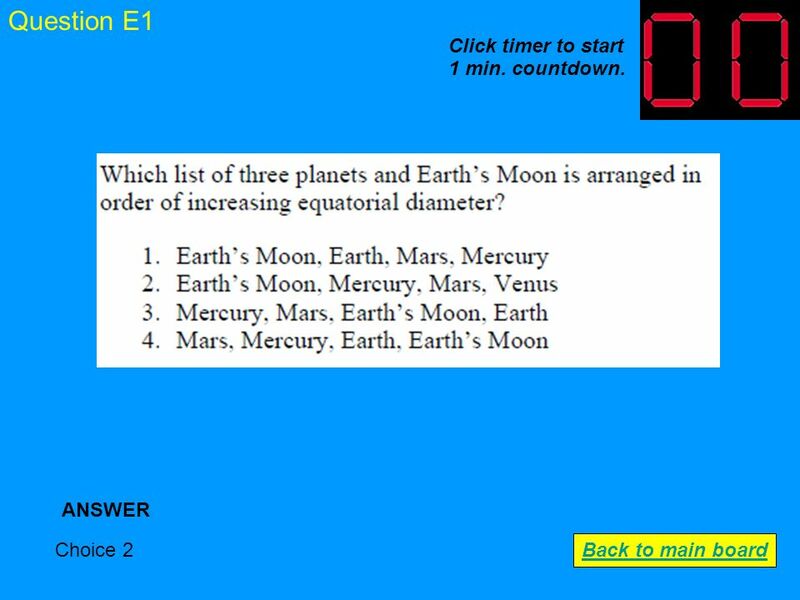 33 Question E1 Choice 2 ANSWER Back to main board Click timer to start 1 min. countdown. 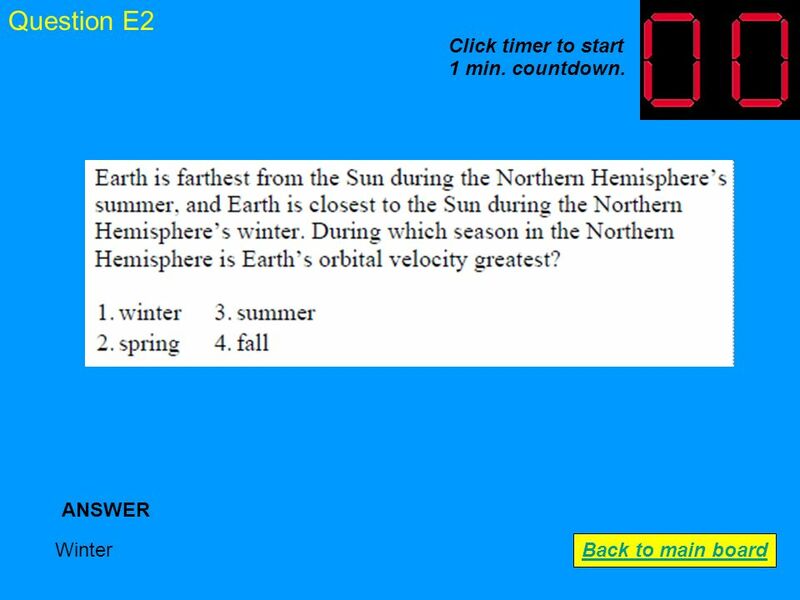 34 Question E2 Winter ANSWER Back to main board Click timer to start 1 min. countdown. 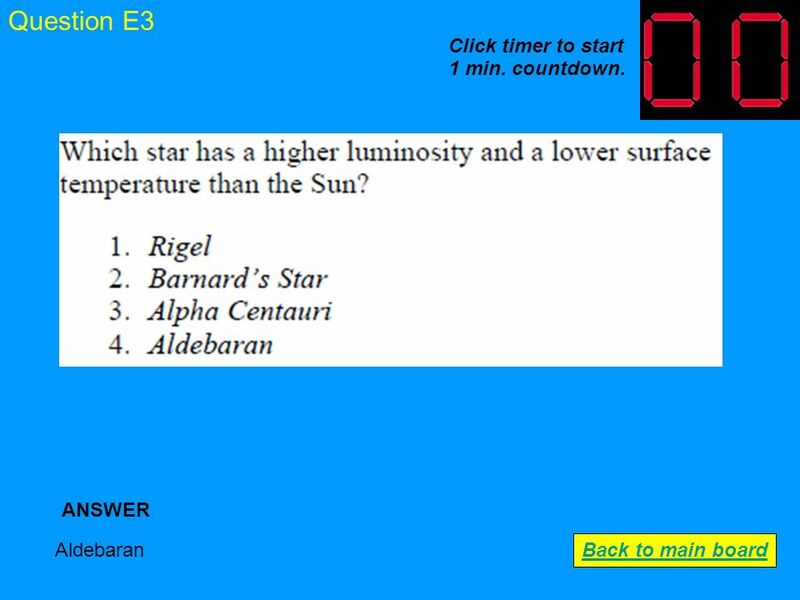 35 Question E3 Aldebaran ANSWER Back to main board Click timer to start 1 min. countdown. 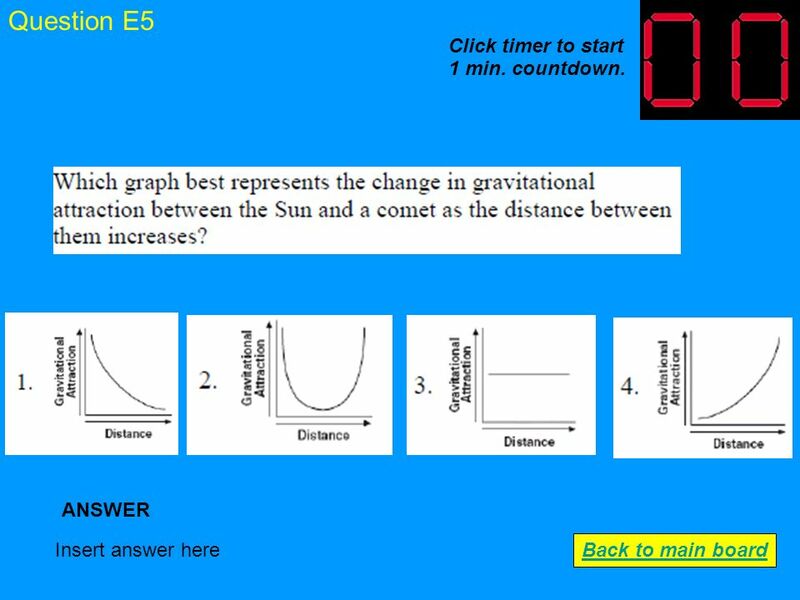 36 Question E4 Choice 4 ANSWER Back to main board Click timer to start 1 min. countdown. 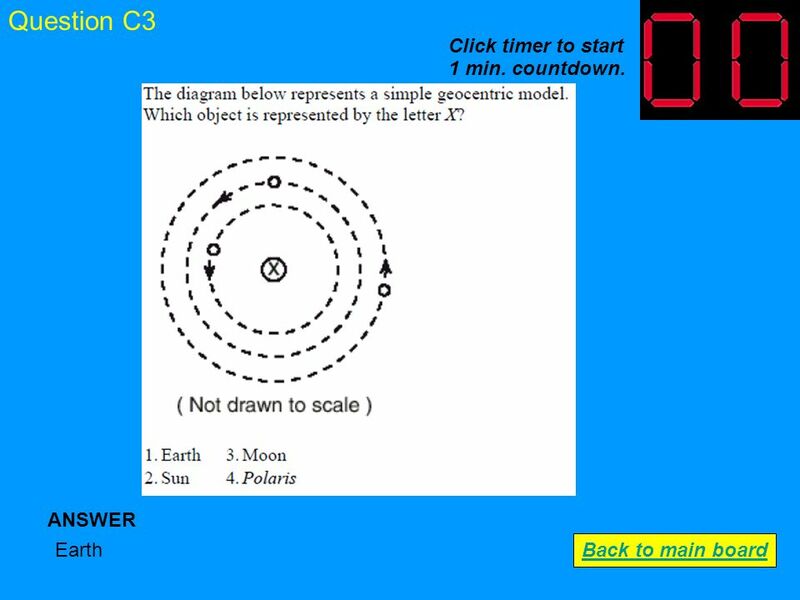 37 Question E5 Insert answer here ANSWER Back to main board Click timer to start 1 min. countdown. 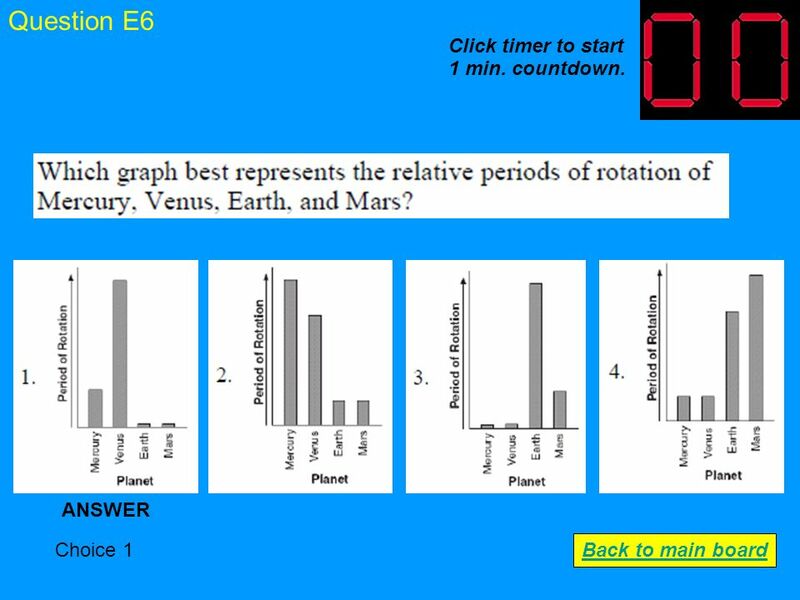 38 Question E6 Choice 1 ANSWER Back to main board Click timer to start 1 min. countdown. 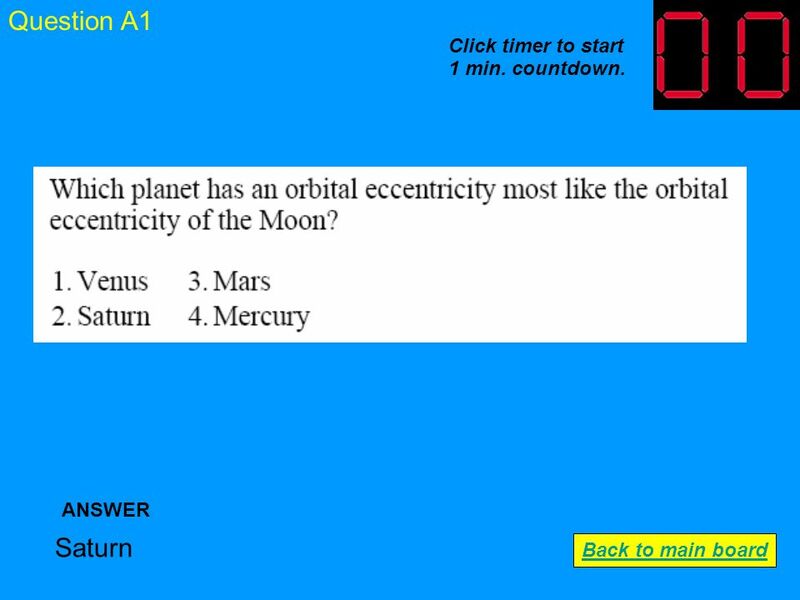 39 Question E7 Choice 3 ANSWER Back to main board Click timer to start 1 min. countdown. 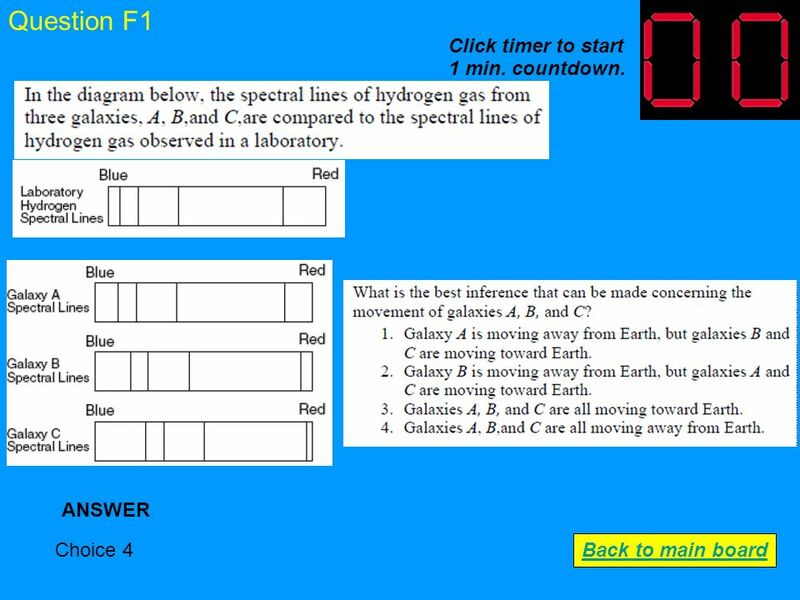 40 Question F1 Choice 4 ANSWER Back to main board Click timer to start 1 min. countdown. 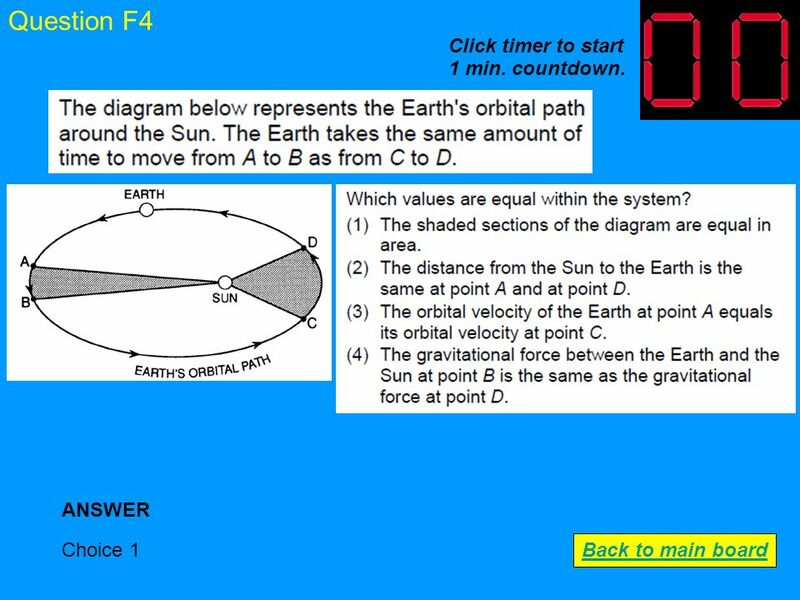 41 Question F2 Earth ANSWER Back to main board Click timer to start 1 min. countdown. 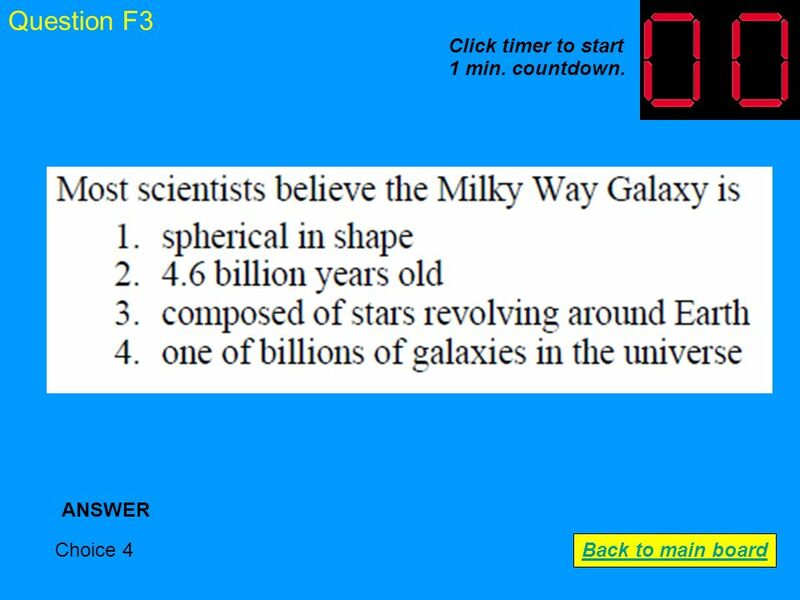 42 Question F3 Choice 4 ANSWER Back to main board Click timer to start 1 min. countdown. 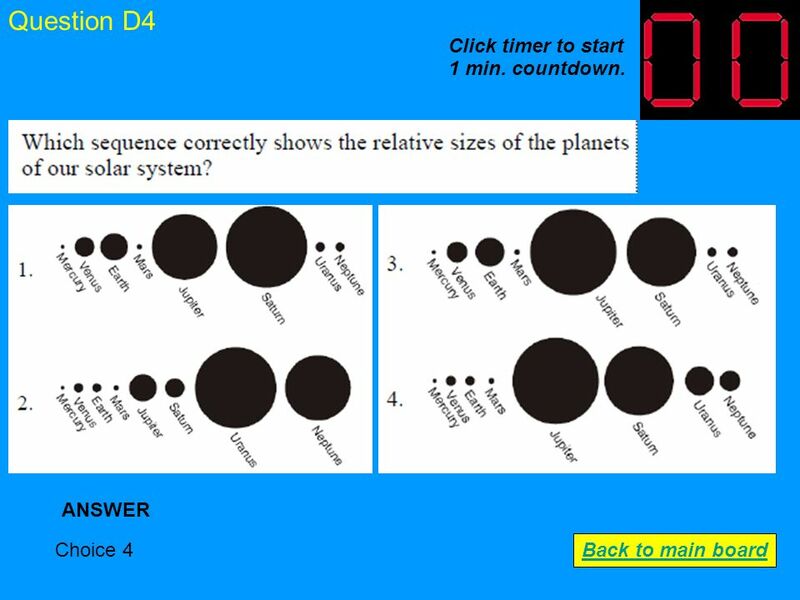 43 Question F4 Choice 1 ANSWER Back to main board Click timer to start 1 min. countdown. 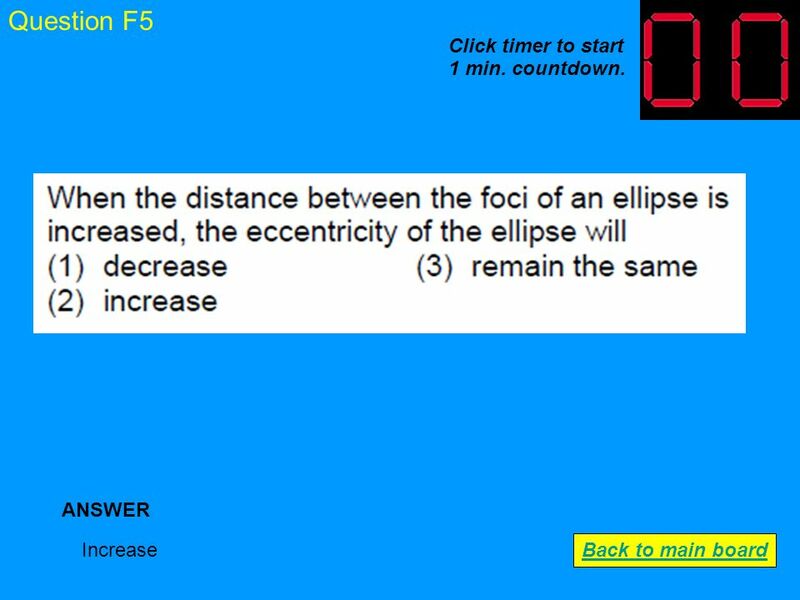 44 Question F5 Increase ANSWER Back to main board Click timer to start 1 min. countdown. 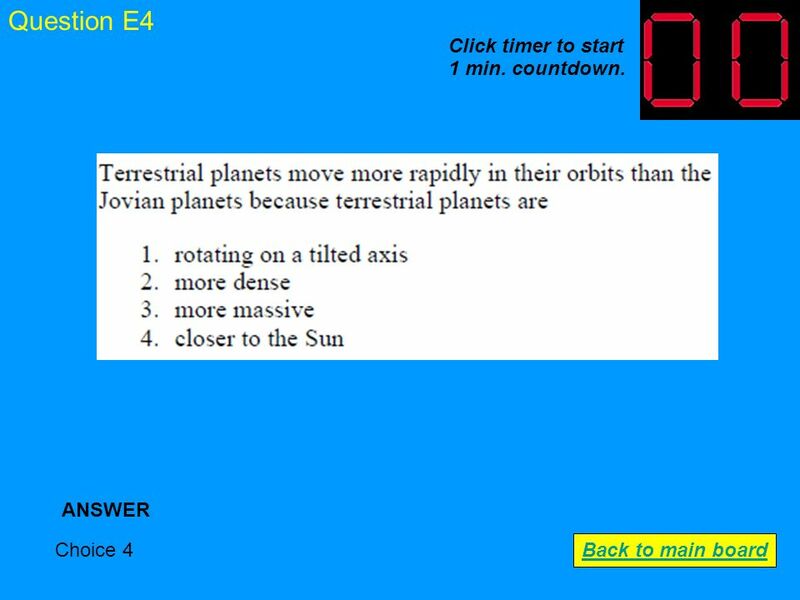 45 Question F6 Choice 4 ANSWER Back to main board Click timer to start 1 min. countdown. 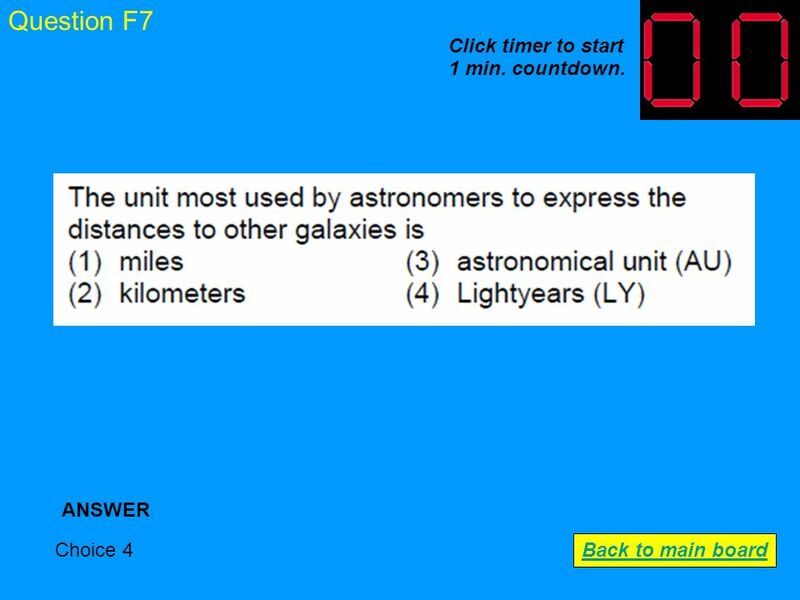 46 Question F7 Choice 4 ANSWER Back to main board Click timer to start 1 min. countdown. 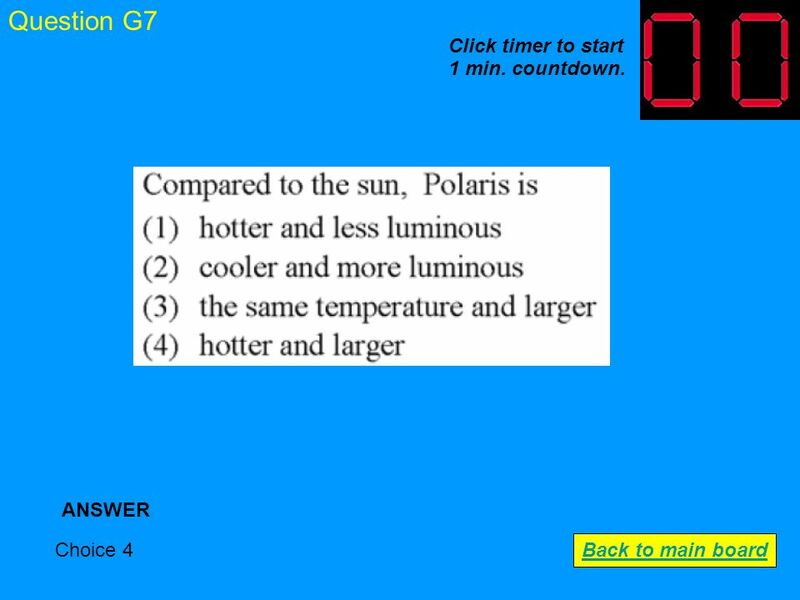 47 Question G1 Choice 2 ANSWER Back to main board Click timer to start 1 min. countdown. 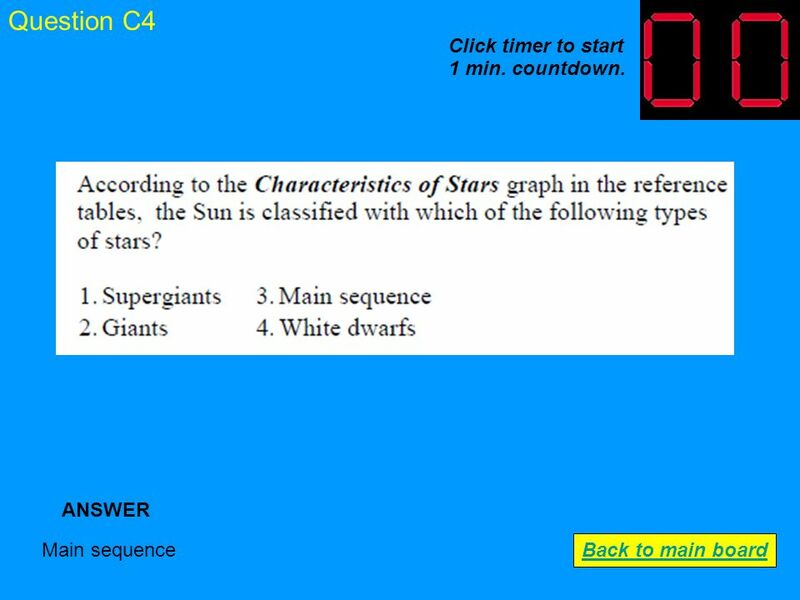 48 Question G2 Choice 4 ANSWER Back to main board Click timer to start 1 min. countdown. 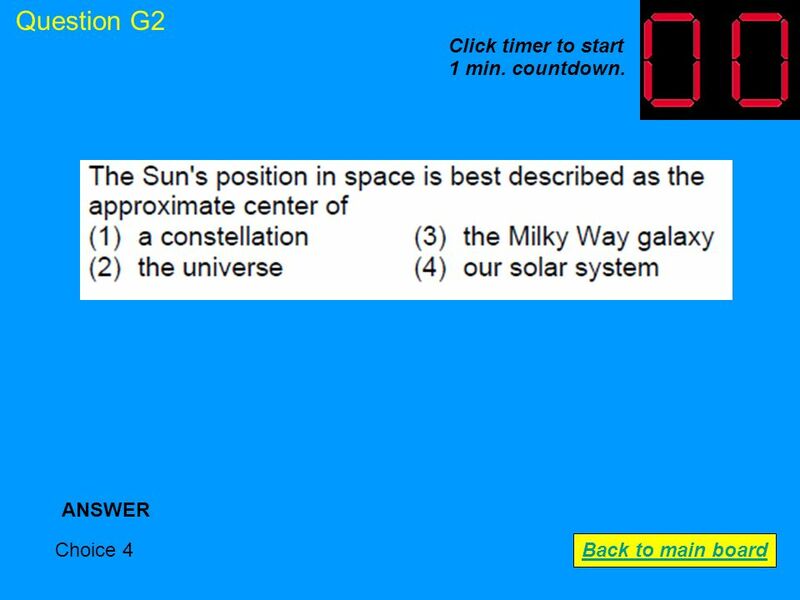 49 Question G3 Choice 2 ANSWER Back to main board Click timer to start 1 min. countdown. 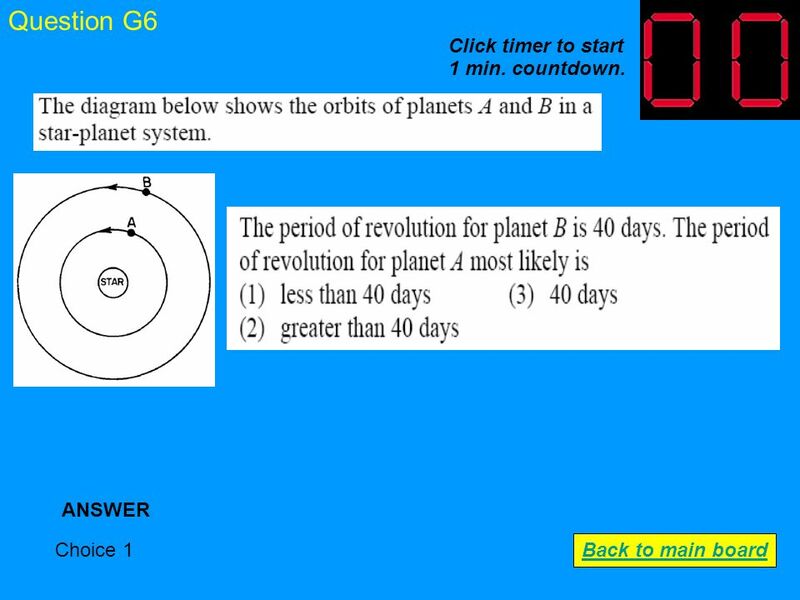 50 Question G4 Choice 1 ANSWER Back to main board Click timer to start 1 min. countdown. 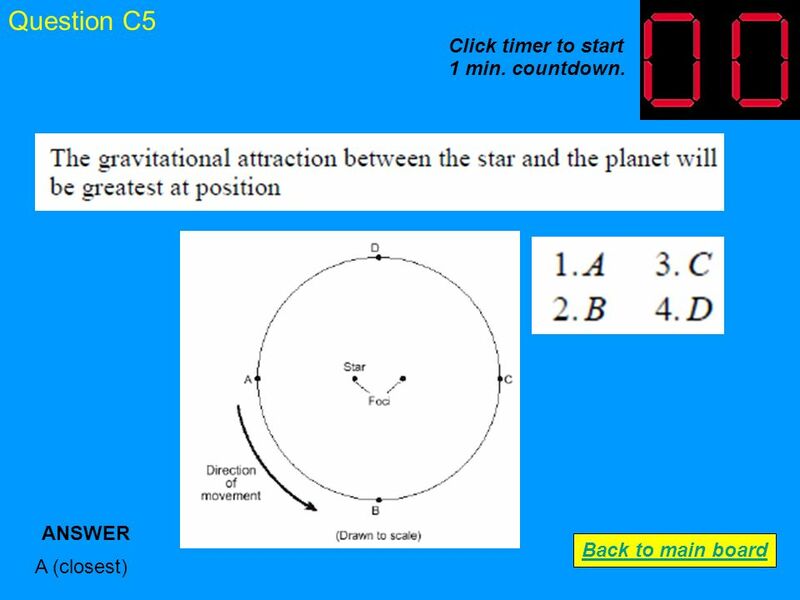 51 Question G5 Choice 4 ANSWER Back to main board Click timer to start 1 min. countdown. 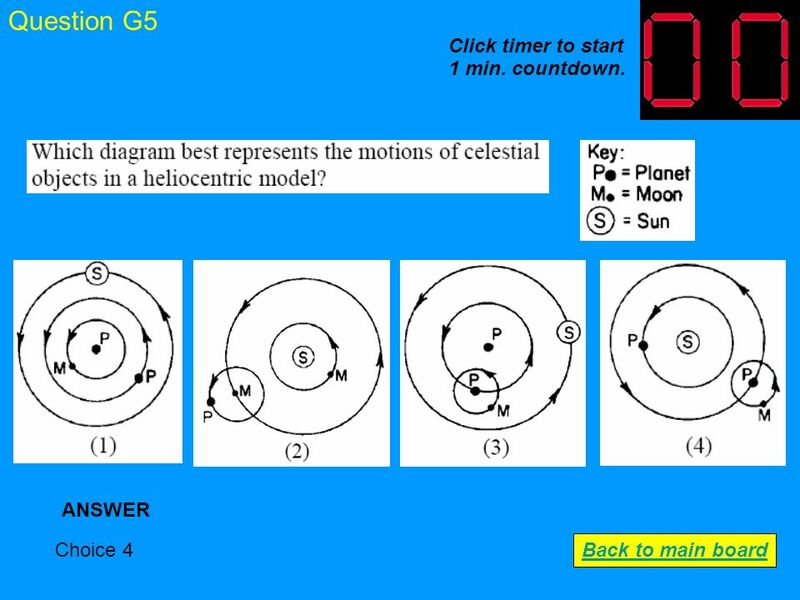 52 Question G6 Choice 1 ANSWER Back to main board Click timer to start 1 min. countdown. 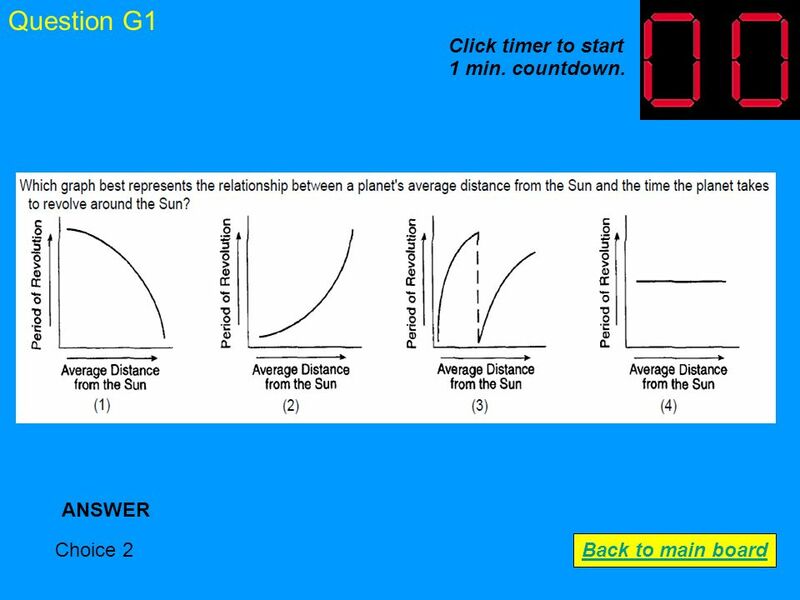 53 Question G7 Choice 4 ANSWER Back to main board Click timer to start 1 min. countdown. 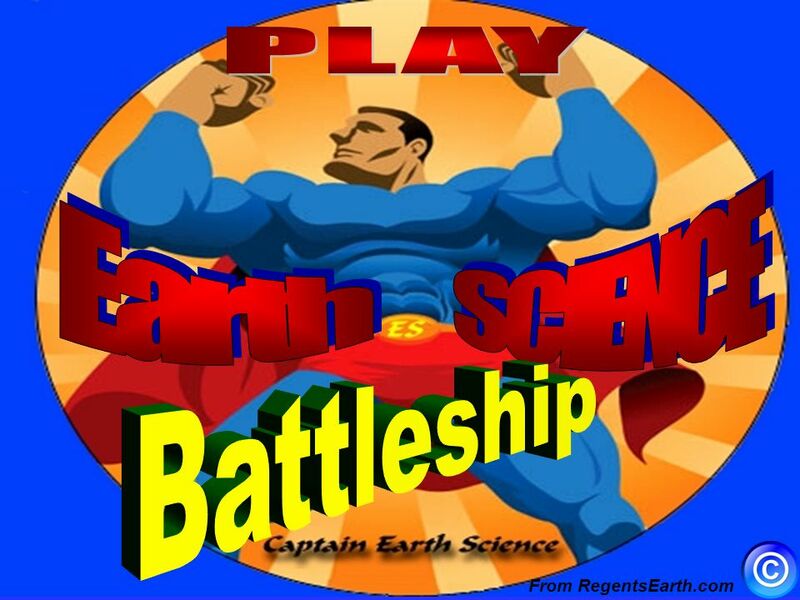 Download ppt "From RegentsEarth.com How to play Earth Science Battleship Divide the class into two teams, Red and Purple. Choose which team goes first. The main screen." Internal Auditing in the Government of Ontario, Canada Stuart Campbell, CIA, CGA, CISA Director, Internal Audit Government of Ontario, Canada. Creating a Basic Calculator using Microsoft Excel Leah Drauch West Point Middle School. Created by Todd Jenkins 100 200 TermsPlaces 300 500 400 200 300 400 500 PeoplePotpourri 100.